A consolidated repository of various scripts and tools I’ve blogged about. 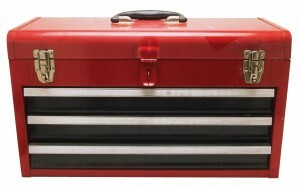 This blog series was designed to help you audit database changes. Contact us if you have any questions about how to select and implement the right auditing solution for your organization with SQL Server Audit. 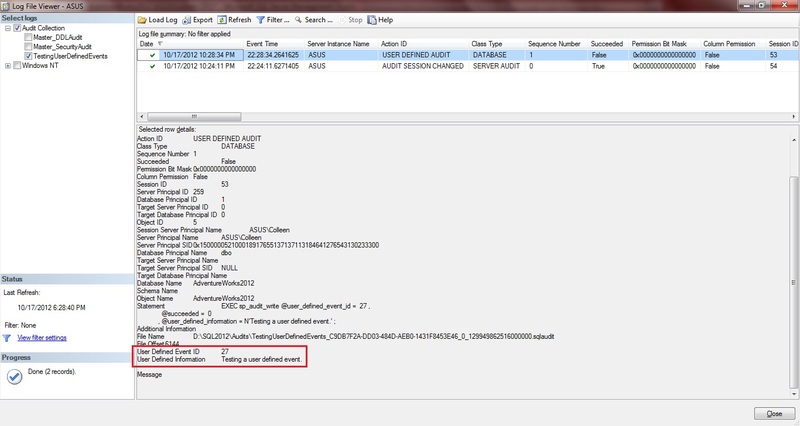 One thing I failed to touch on during my series on SQL Audit was the use of user-defined events in audits. This was brought to my attention in a comment by one of my readers. He was trying to make use of user-defined events and was having a problem getting the output to actually write to the audit file. Since I was writing some code to recreate the problem on my system anyway, I decided to post it here. Why might you want to create a user-defined event audit in the first place? 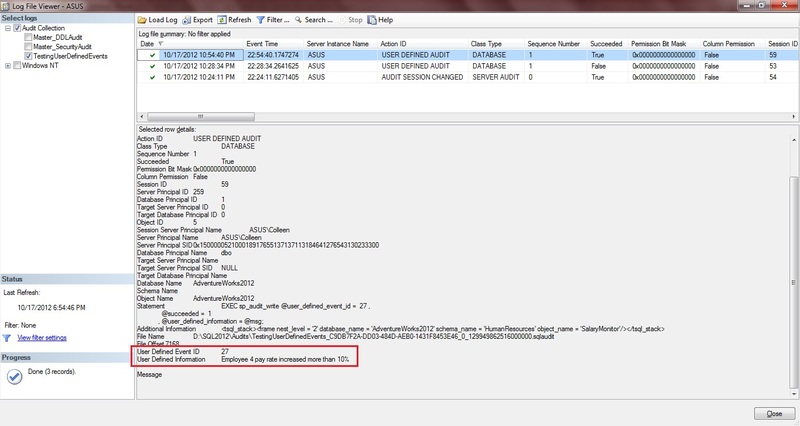 Well, we already know that we can use SQL Audit to audit access to certain objects. So let’s say we have a table with salary data. We can use the SCHEMA_OBJECT_ACCESS_GROUP to audit access to any object in that schema. We can also use SELECT, INSERT, UPDATE, and DELETE actions to audit those actions on specific objects. But let’s say even getting that granular will produce more audit output than we’d like. Suppose we only want to know when an employee’s salary is increased by more than 10%. We can’t do that with any of the canned actions. But we can do that with a custom event. The first step is to configure the audit object. Once we’ve got that configured we create the audit specification. This can be either a server audit spec or a database audit spec, depending on your needs. Just make sure to add the USER_DEFINED_AUDIT_GROUP action. And don’t forget to enable both the server audit and the audit spec. If we check the audit log, we should see the event. Now if we test the trigger by virtually doubling employee 4’s rate and only increasing employee 8’s rate by a small amount. We should see an audit record for employee 4 in the output, and we do. You might be wondering if you can configure an audit to only capture specific user-defined event IDs. Great question, and you can by filtering on the user_defined_event_id field in the server audit. So there you have it, another way to tailor SQL Audit a bit more to your specific needs. Happy auditing! Auditing doesn’t have to be scary. SQL Server Audit 302 – Deploying Audit Solution with Powershell is part of a blog series designed to help you audit database changes with SQL Server Audit. Contact us if you have any questions about how to select and implement the right auditing solution for your organization. Auditing doesn’t have to be scary. SQL Server Audit 301 – Using Powershell to Manage Audits is part of a blog series designed to help you audit database changes with SQL Server Audit. Contact us if you have any questions about how to select and implement the right auditing solution for your organization. Today we’re going to go over some very basic scripts to create, drop, and copy SQL Audit objects using Powershell and SMO. Managing SQL Audit objects via PowerShell is actually pretty simple, even for a newbie like me. And I’m proud to say that these might be the first PowerShell scripts I’ve written that were entirely my own and not based on someone else’s work. I might actually be learning something!� Nah, probably not. Now that we’ve got the basics of managing audits using PowerShell under our belts, we’re going to use these skills to deploy the audit solution I talked about previously. That’s what we’ll do next in SQL Server Audit 302 – Deploying Audit Solution with PowerShell. Good stuff people!! Auditing doesn’t have to be scary. SQL Server Audit 201 – Creating Audit Solution is part of a blog series designed to help you audit database changes with SQL Server Audit. Contact us if you have any questions about how to select and implement the right auditing solution for your organization. Welcome back, folks! Ok so, now that we’ve covered the basics of creating a SQL Audit and viewing the output, let’s put the pieces together to form a complete solution. As with any implementation, the key to success lies in careful planning. Before we take off running, we need to take a moment and figure out exactly where we want to go. What if I want to deploy SQLAudit to a number of instances/databases? I could point and click my way through it, but that’s asking for a typo or configuration mistake. I could script it in T-SQL, but that’s so last year. So how about we use PowerShell? In SQL Server Audit 301 – Using PowerShell to Manage Audits, we’ll go over ways to create, drop, and manage SQL Audit via PowerShell and we’ll use a master audit as a template for deploying audits to the instance/database of our choosing.